It looks like there may have once been a bottom step which matched the others. 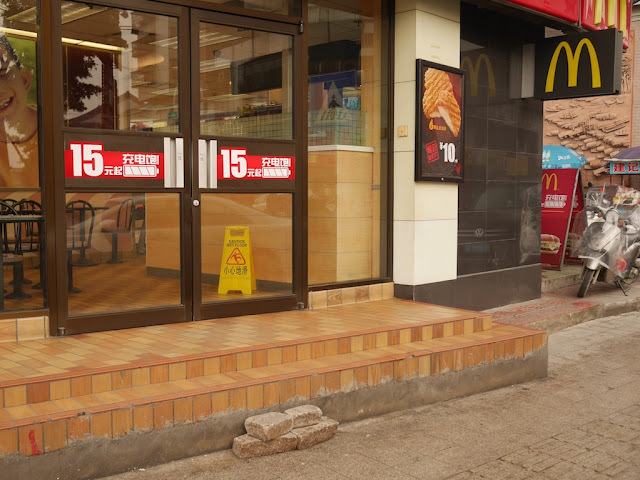 Perhaps McDonald's had extended the steps too far according to watchful eyes and paid the price, though it would seem to be a minor transgression in Jieyang where sidewalk space is often obstructed or nonexistent. Whatever the case, the narrower and probably less-stable brick step may do more harm than good. At least they have another entrance to use. 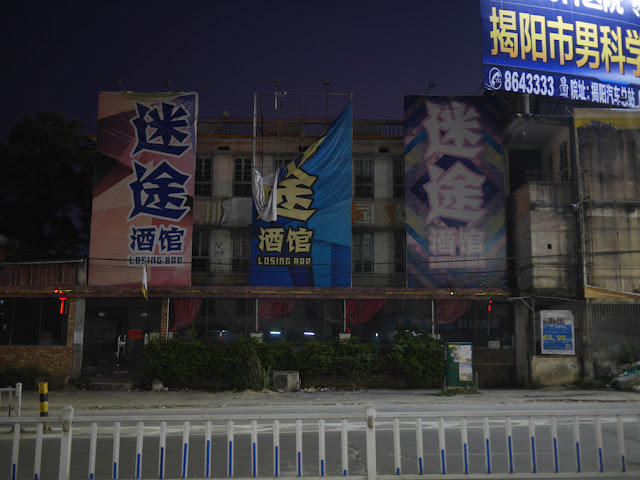 One night about a month ago on Wanjiang North Road in Jieyang, I noticed a bar with an unusual, but possibly fitting, name. 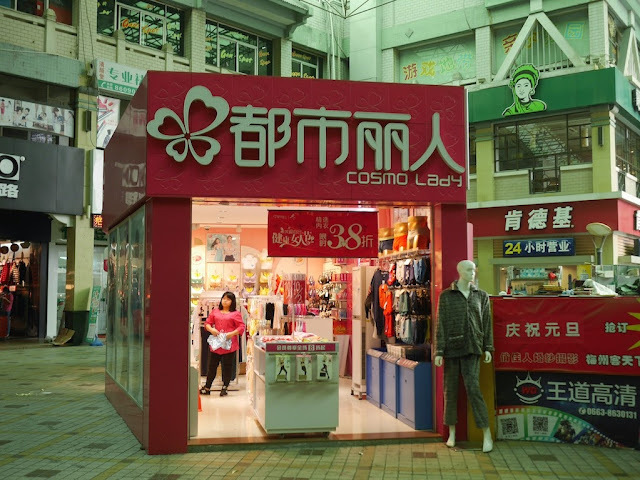 The bar's Chinese name "迷途" (mítú) has a dictionary translation of "to lose one's way", which expresses a different message than the English name chosen for the bar. That doesn't necessarily mean the name was a mistake or the creator wasn't aware of the difference though. Whatever the case, it appeared the Losing Bar had, well, lost. The sign was in need of repair and there were no lights on during a prime bar time. Two nights ago at the same location, I saw things had changed. 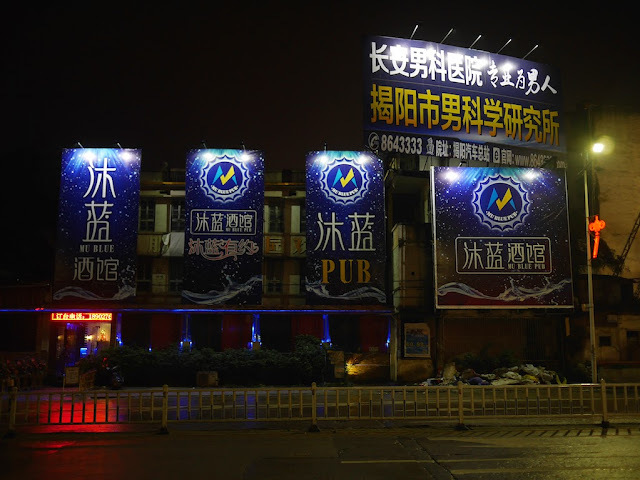 The Mu Blue Pub took a different approach to translating its name, 沐蓝 (mùlán), into English by using the standard Pinyin transcription for the first character and the English translation for the second character. Perhaps this was done to avoid a more difficult task of translating both characters into a fitting English name. I didn't go inside the new pub and won't have the opportunity to visit it in the near future. 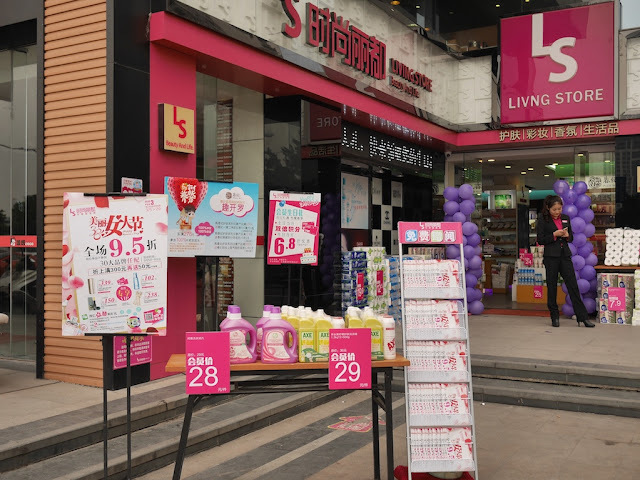 Given the turnover I have seen in Jieyang, a topic for another day, I wouldn't be surprised to see something else there if I return in a year or two. But maybe the Mu Blue Bar will be a winner. 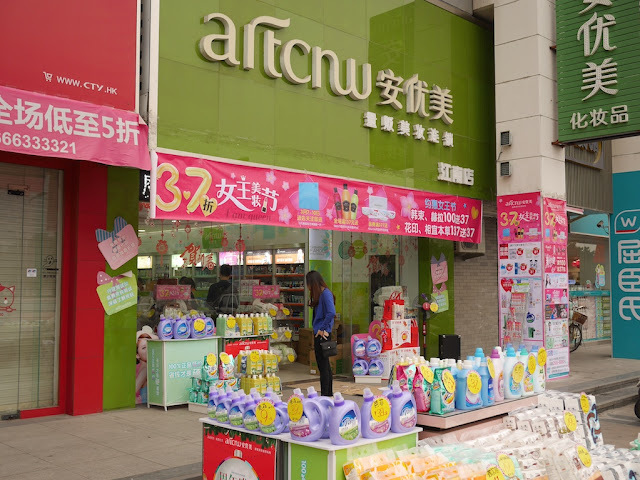 When I visited Apple's store in Xiamen, China, during its opening a few months ago, I saw there was no shining Apple logo visible from outside the store. Employees explained this was part of a new look, and one of them told me about an Apple logo hidden on an outside wall. It took me some time, but I found it. I would be rather impressed if anybody noticed the logo without first being told of its existence. The above photo provides an accurate sense of the logo's visibility. Really, it's there. It can be seen a little more easily close up. Employees explained Apple wants people to focus more on the products than the logo and believes its stores' distinctive design will be enough for people to identify them. Apparently they have had a slight change of heart since then. When I returned to the store today, I saw that the hidden logo isn't so hidden anymore. A store employee told me there had been several versions of the logo, each progressively darker to make it more visible, since my earlier visit. I joked that I expect if I come back again the logo will have a border of flashing lights. I refrained from joking about iterative design. I have questions, such as whether the initial design was truly deliberate and what feedback motivated the latter changes, but answering them would require reliable information about behind-the-scenes decision making. I'll just hope for the lights. 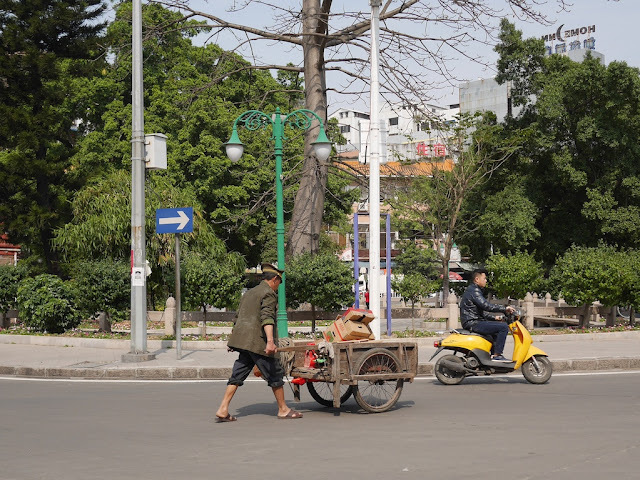 Earlier I shared a photo of two men sleeping in carts. 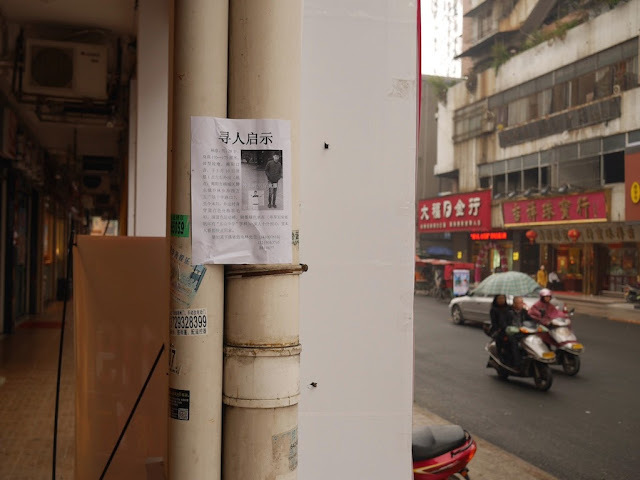 I have seen the man on the left side of the photo several times in the same area of Jieyang. Sometimes he has a cart. Sometimes he doesn't. But he is always wearing the same hat. I haven't seen it up close, but it appears to be an old police hat. Yesterday I saw him again. 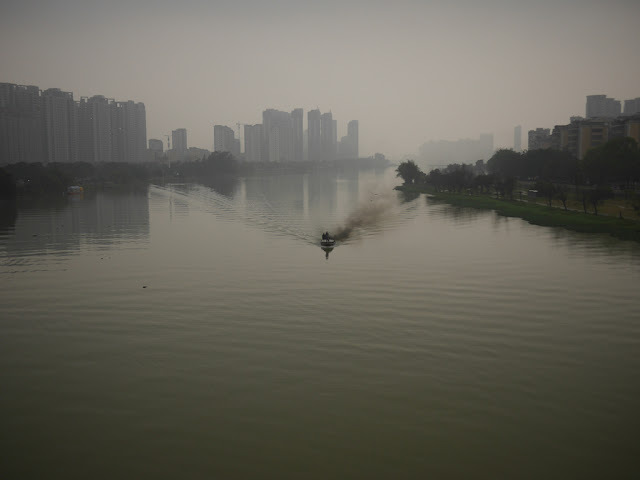 I watched from across the street as he sauntered in a general direction without his cart while a light rain fell. 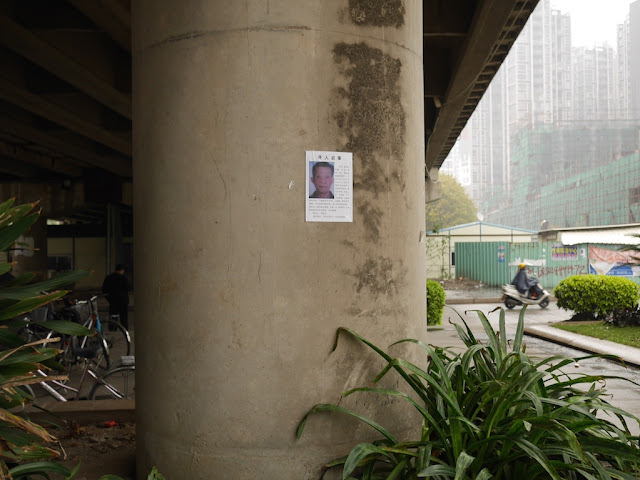 Soon he stopped in front of one of the missing persons signs I shared in the previous post — one he had surely passed before. 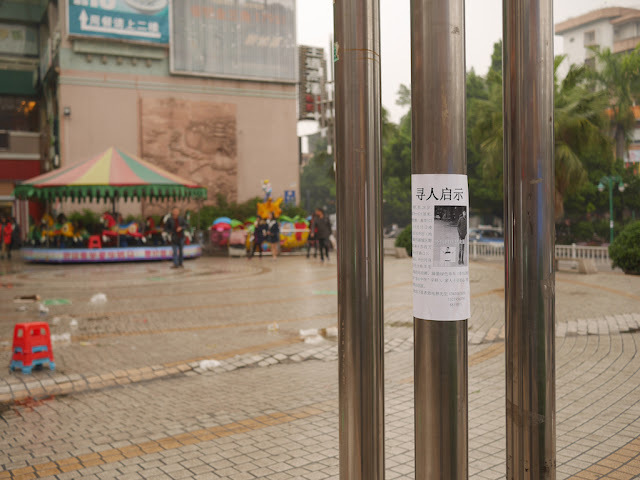 He looked at the sign for a few seconds, and then casually peeled most of it off the pole — not difficult due to the recent rain. What happened next was even more unexpected. Just a few feet away he reached into the bushes which surround a public square and pulled out a large metal pitcher. As it continued to rain, he poured some water over where the sign had been. 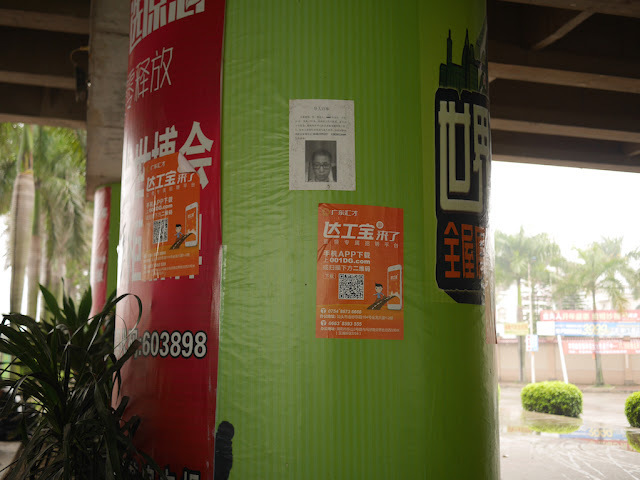 It didn't make much of a difference on the paper which remained stuck to the pole. He then returned the pitcher to its place hidden in the bushes and walked off. 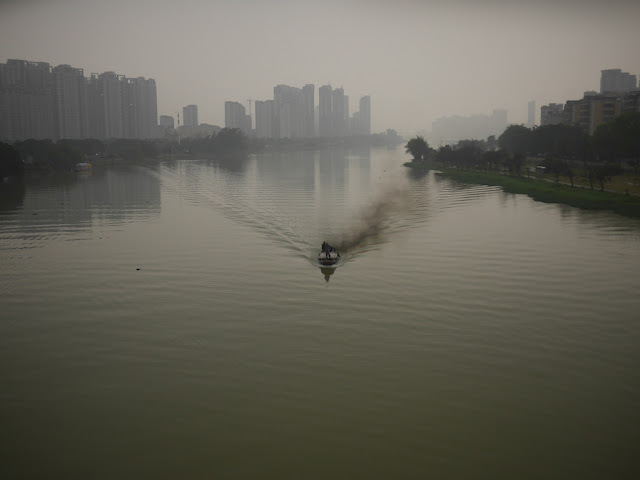 It didn't appear to be part of a more widespread effort. 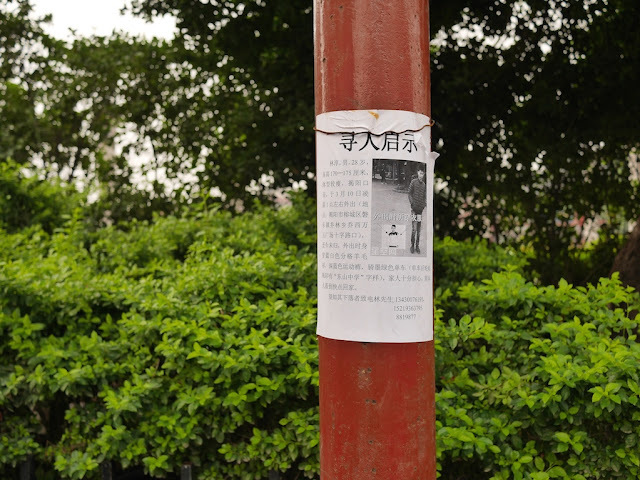 Other nearby missing persons signs still remained. And I wondered where the man was headed next. 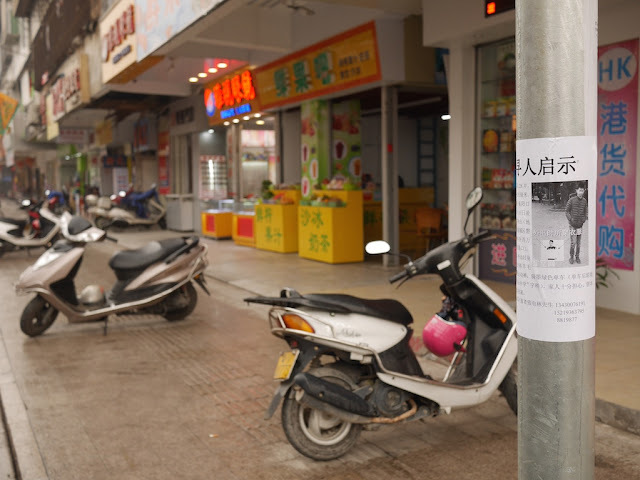 I haven't only seen signs for a missing dog in Jieyang . . . 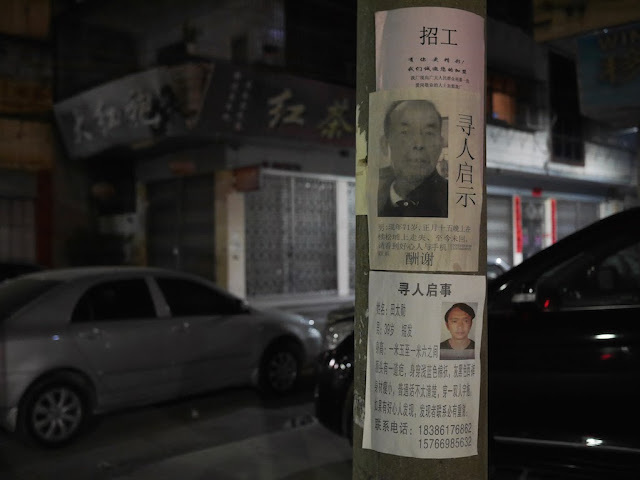 In the past, shelters mainly published a missing person's information on local media for a limited time. 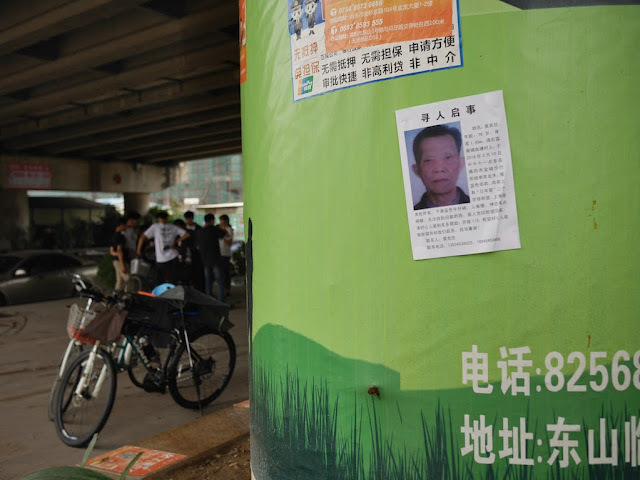 If the missing person was not a local resident, families from outside the region may not have been able to see the information. 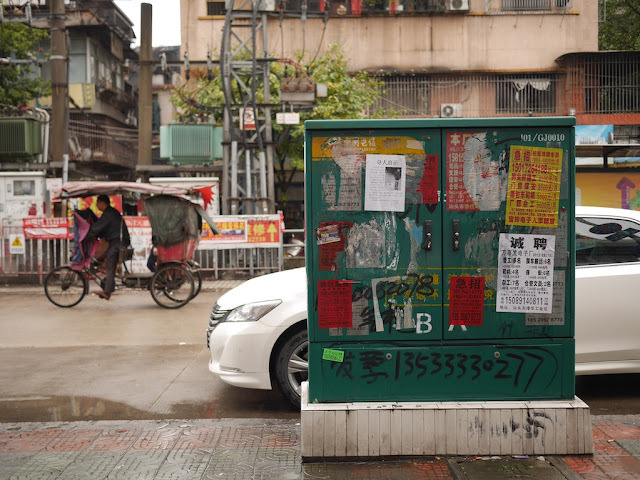 According to [Wang Jinhua, director of the Social Affairs Department of the Ministry of Civil Affairs], despite the Internet, most missing persons are still located in a traditional way - cooperation between shelters and police. 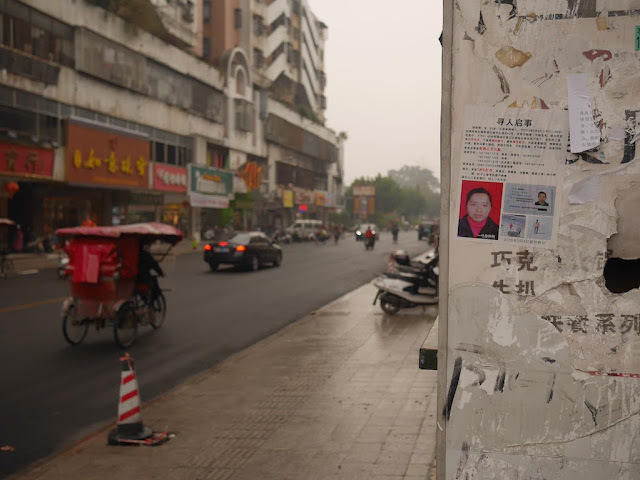 The website is currently limited to those in shelters — places where many missing persons can't be found, whether due to kidnapping and child trafficking, secret police detention, or other reason. 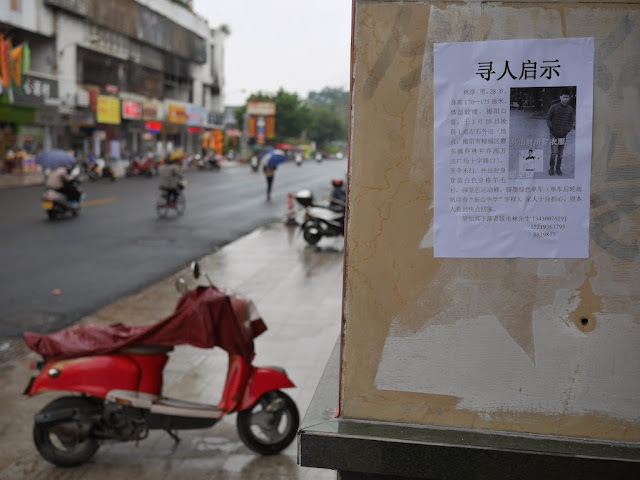 But at least the website may help reunite some of China's missing persons with their families. 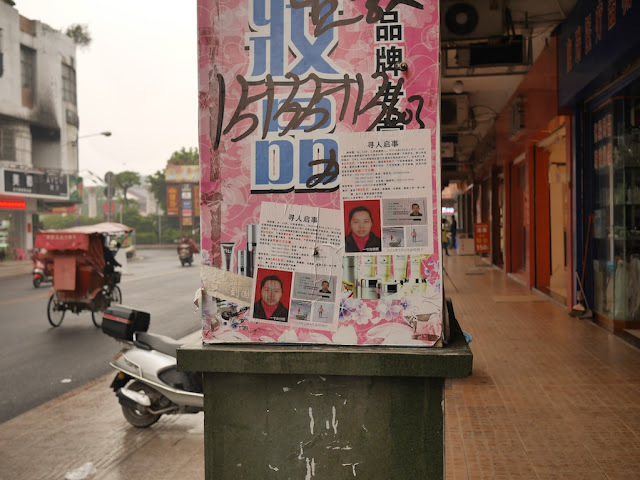 Below are sixteen signs I have recently seen in Jieyang posted for seven missing persons. 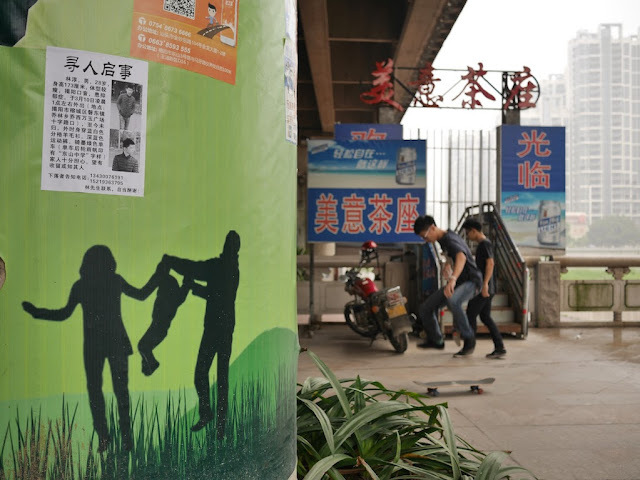 Like the photos and descriptions on the Ministry of Civil Affair's website, they expose a more personal side of a problem than what can be expressed merely through numbers. 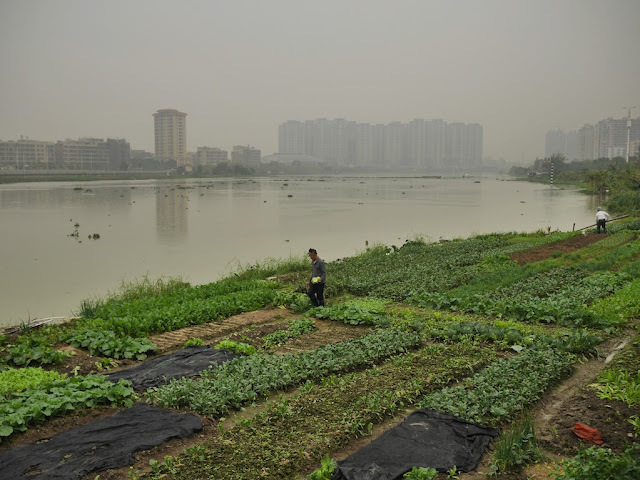 And the settings of everyday scenes, some with people going about their lives as usual, only amplify the signs' poignancy. 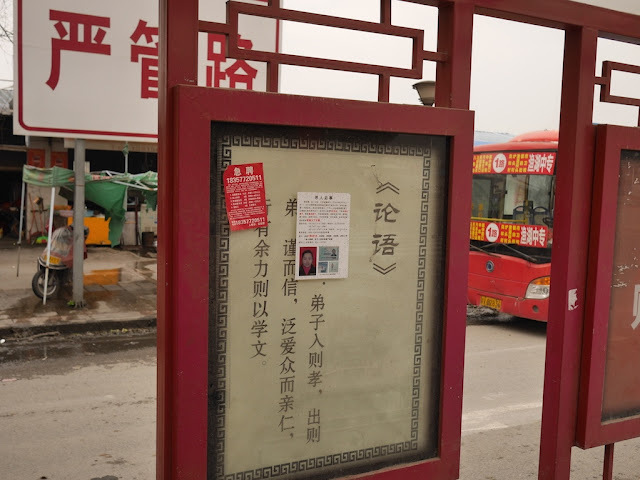 While walking through the alleys and streets of Jieyang's old town in Rongcheng last month, I came across multiple copies of the same sign. Somebody had lost their two-month-old puppy, and they were hoping others could help them find it. 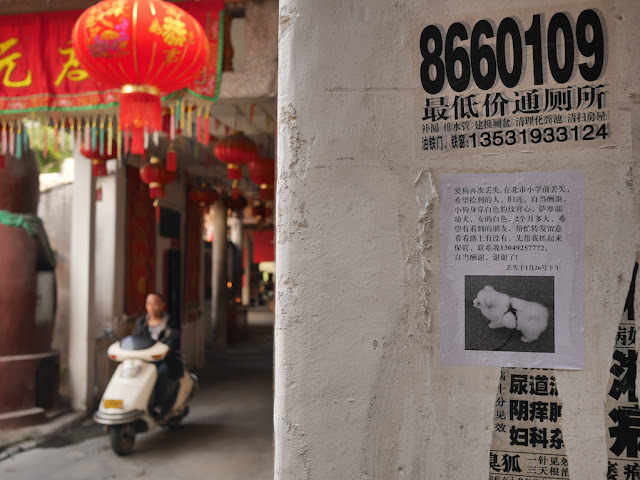 In most of China few dedicated resources and organizations that could help reunite a dog with its owner exist. 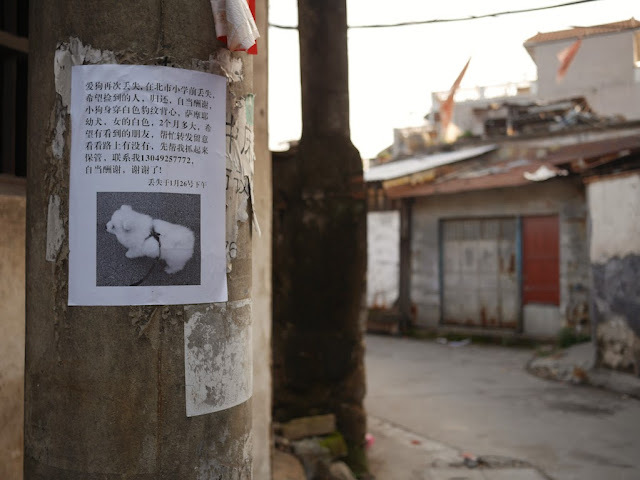 And dogs here face a potential fate uncommon in much of the rest of the world. 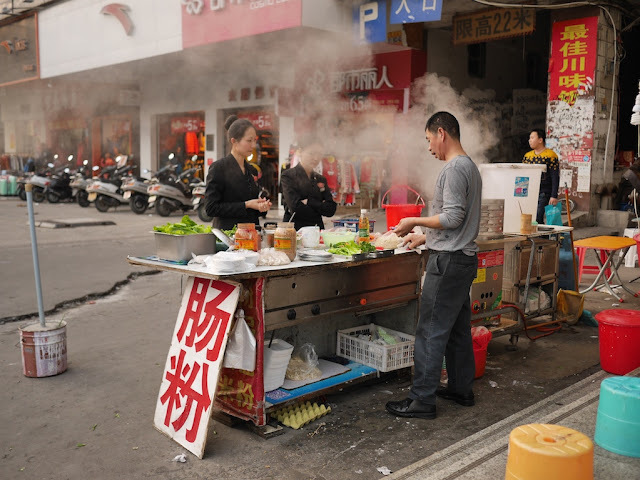 In Jieyang it could come in the form of a simmering hotpot. 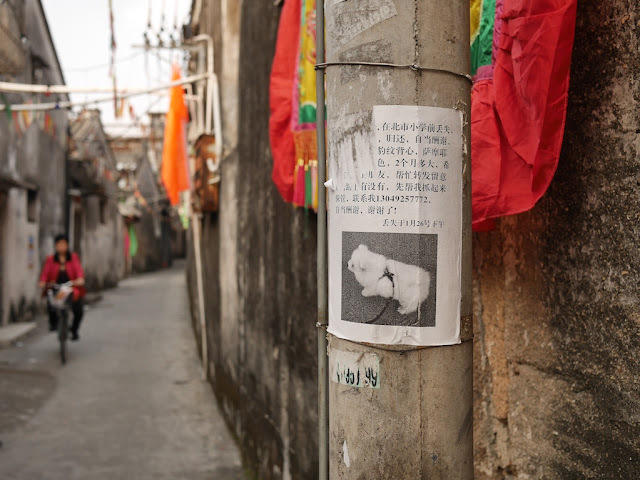 Losing a pet is difficult no matter one's location, though. 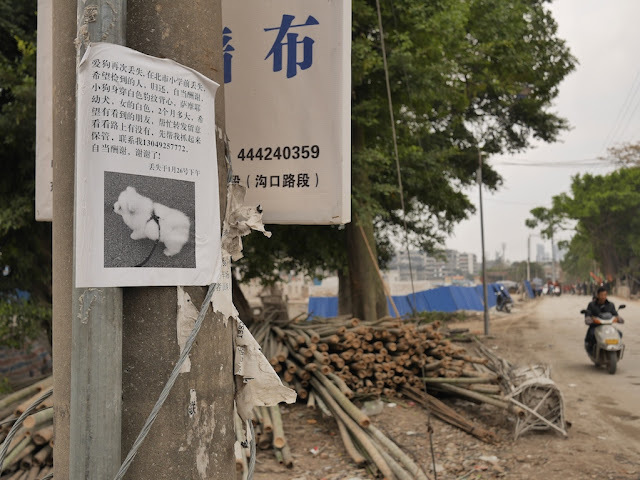 I don't know how things turned out for this dog, but the numerous signs show somebody tried hard to find a happy ending. Both carts look like more stable places to sleep than earlier examples I have shared. I am torn over which one would be more comfortable though. Either way, it was good weather for an afternoon nap. 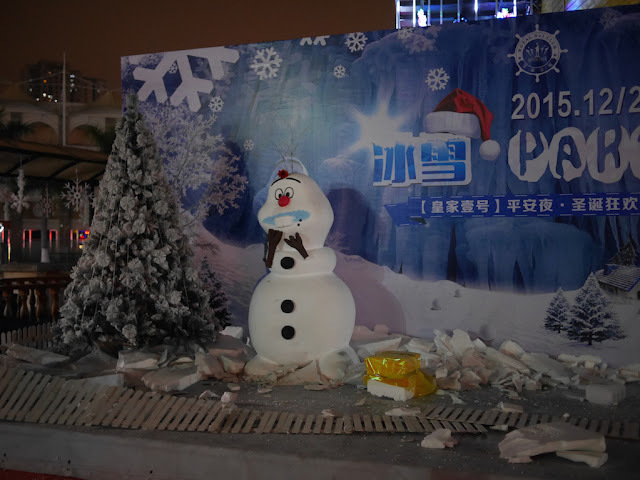 A nativity scene with Olaf wasn't the only mix of Christmas and the movie Frozen I saw a few months ago in Xiamen. I also saw an advertisement for a Frozen-themed Christmas party at the Royal No. 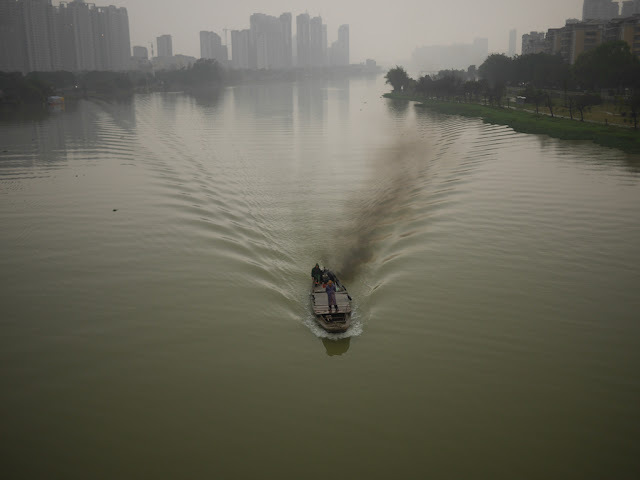 1 Club (皇家壹号). Using large broken pieces of styrofoam for snow was a special touch. Sadly, I must report that I didn't go to the party and couldn't find any photos of it after a brief online search. So instead I will share a link to the first set of photos and video I found for another night at the club. 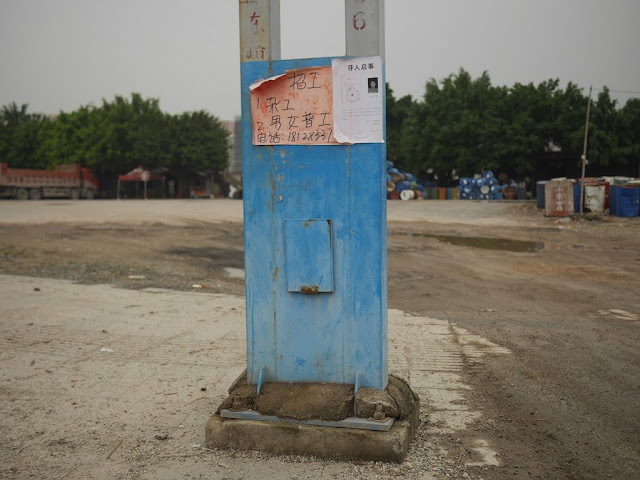 They may push the boundary of "safe for work", though China's censors haven't been bothered (a defense HR would surely appreciate). I will share here one hopefully safe-for-work photo from the set which includes a couple of "mobile moments" — not everybody seemed captivated by the live entertainment. 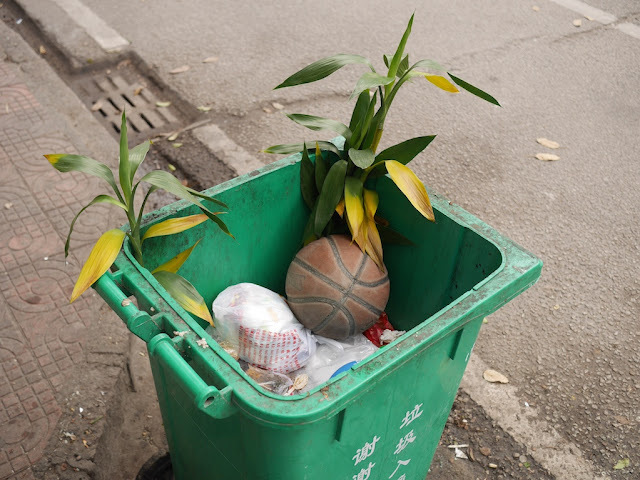 Just imagine a similar scene with Frozen characters and crushed styrofoam. Perhaps that will be close to what the Christmas party was like. 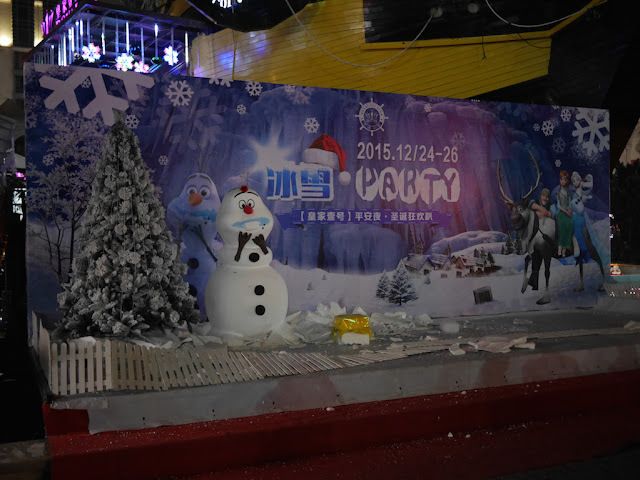 I previously didn't offer any explanation for a nativity scene in Xiamen which included a snowy Disney character. But, as usual, context matters, so now I will share some. 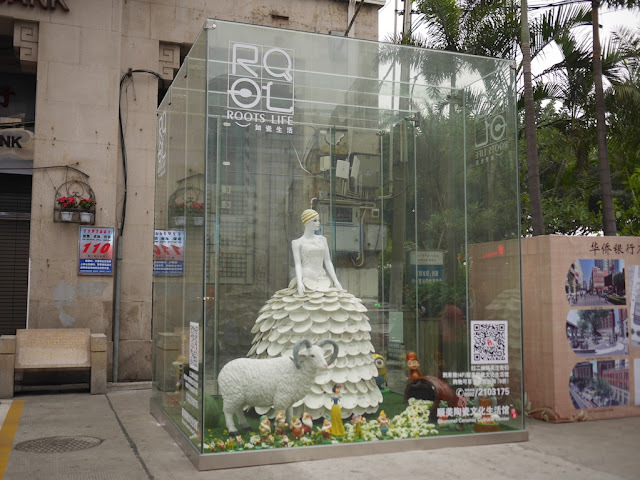 There were two related displays at the Zhongshan Road Pedestrian Street. Neither had a similar Christian theme. 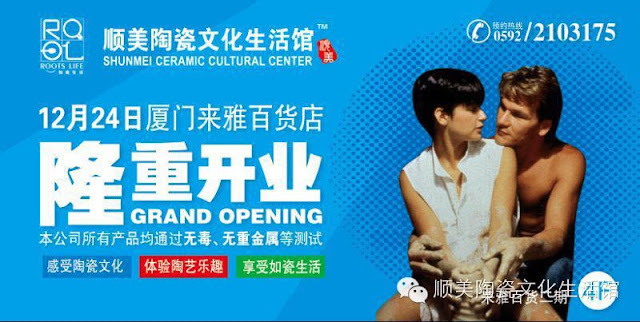 Long story short, they were all part of a promotion for the grand opening of the Shunmei Ceramic Cultural Center. 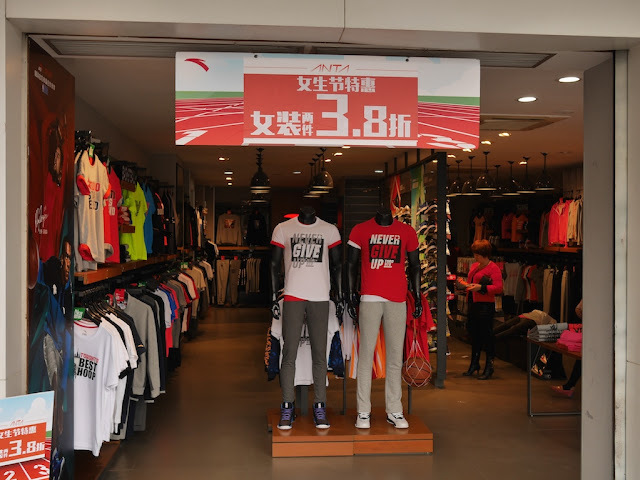 According to the Shunmei Group's website, the company has passed a "factory audit of Disney". 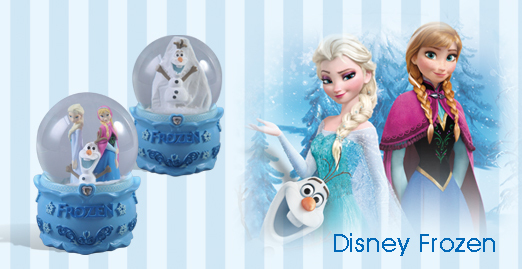 The website currently features some Frozen-themed items. Olaf's presence in the nativity scene now seems less mysterious — same with the Snow White and the Seven Dwarves' and even the non-Disney minion's presence in the first photo above. 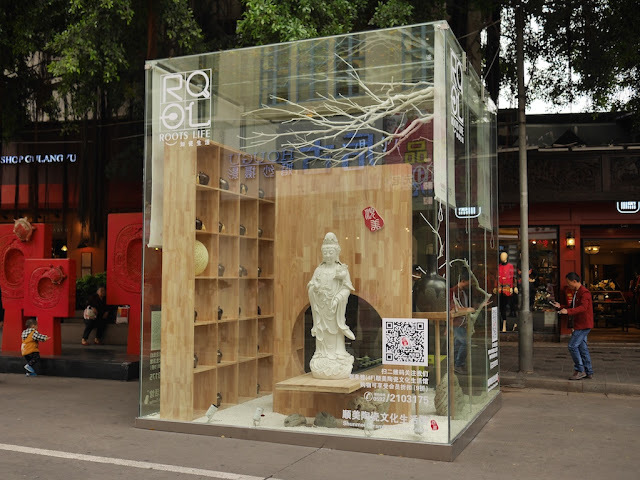 A Shunmei post in Chinese provides some examples of the items which would be available for purchase at the Shunmei Ceramic Cultural Center. It also has an advertisement for the grand opening which includes part of an iconic scene from the movie Ghost. This raises obvious questions such as "Where is Olaf?" and "Are they making a ceramic minion?" This is yet another example where digging deeper raised more questions than it answered. But at least some were answered. Maybe. In a desire to mix things up and present myself a challenge, today for the first time ever I told my younger brother "you can pick the photo for today's post". The instructions were vague, but I figured he would understand what I was after. Of course, he didn't, and after expressing excitement he sent me an image from The Oatmeal. Brothers . . . I began to regret my offer and pointed out it wasn't a photo. My brother proposed it may have been a photo taken in a cartoon world with a cartoon camera. This is why we didn't have better things growing up. 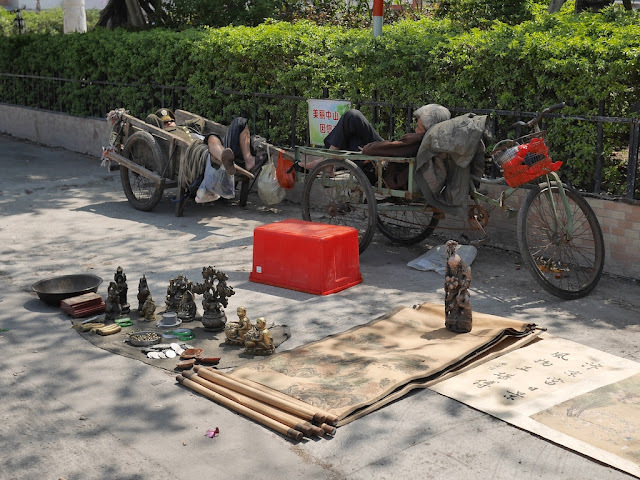 He soon made another attempt, though, and asked, "Do you have a picture of a Chinese Jesus?" I didn't see that coming at all, and it raised several intriguing issues. As I searched my mind for something relevant I have come across, he added, "I've seen Korean Jesus and Vietnamese Jesus, but I don't think I've seen a Chinese Jesus." And if I was lacking motive, my brother provided one: "Jesus always brings in the pageviews." 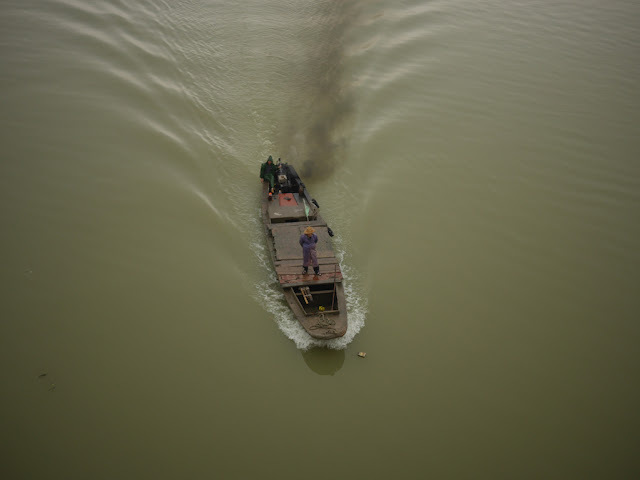 One possible connection was Hong Xiuquan, a leader of the Taiping Rebellion and "self-proclaimed brother of Jesus Christ" — quite a story there. 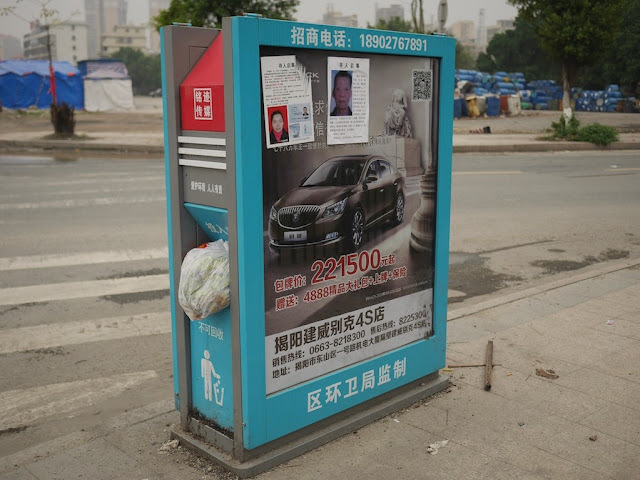 But I have not visited the Hong Xiuquan Memorial in Guangzhou, so I didn't see much potential there. 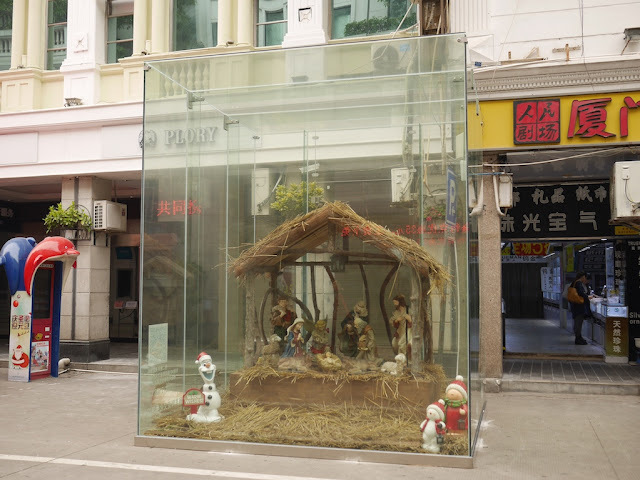 The best I could come up with was a nativity scene I saw a few months ago at the Zhongshan Road Pedestrian Street in Xiamen. Not only did it include Jesus (unsure of ethnicity but probably not Chinese), it also included something connecting to my brother's earlier cartoon theme — Olaf (snowperson), a character from Disney's animated movie Frozen. Olaf's sign said "Warm Wishes". As with my brother's request, I am not going to even try to explain the display. But I will add that it was popular for selfies. 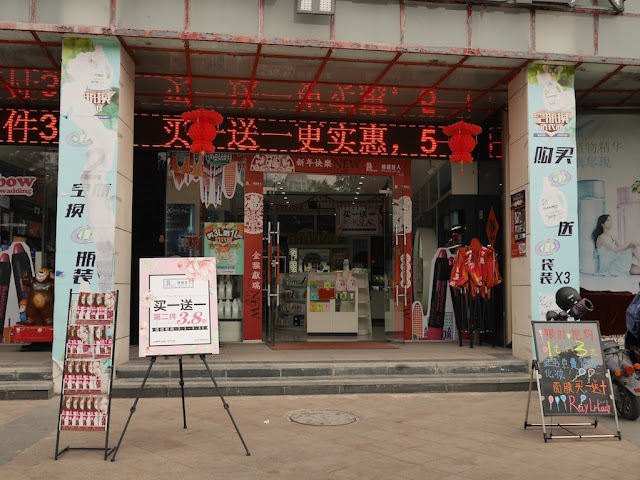 Like a dog in Taiwan, my brother took me in unexpected directions. And in both cases there were religious destinations. What a world. Update: More context and a bit of an explanation for the display here. 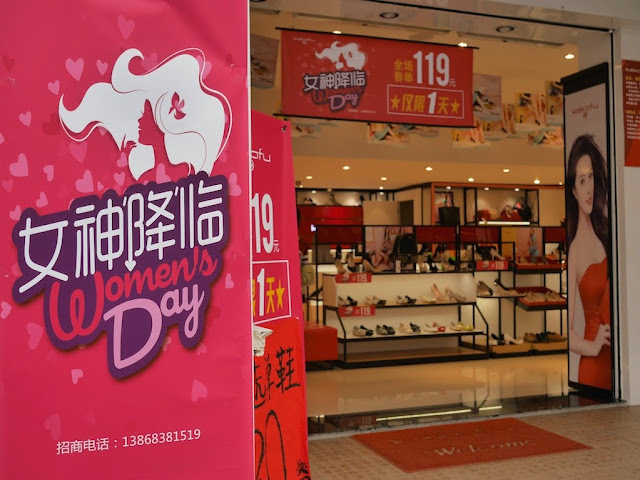 In an earlier post about International Women's Day in China, I mentioned I recognized the location of a photo shared by Xinhua News. 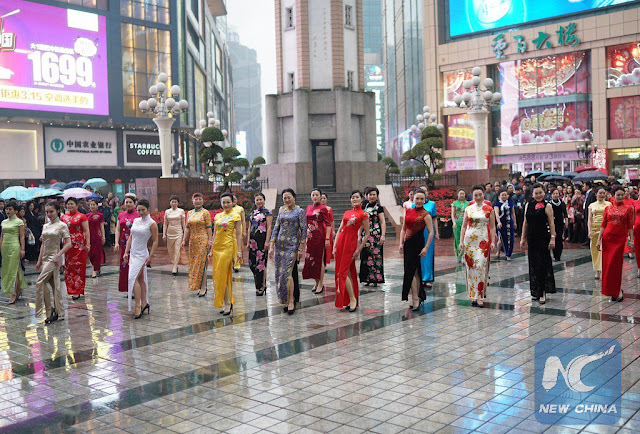 One clue in the photo was a portion of the People's Liberation Monument, hard to miss at Jiefangbei Pedestrian Street's central square in Chongqing despite the many much higher structures nearby. 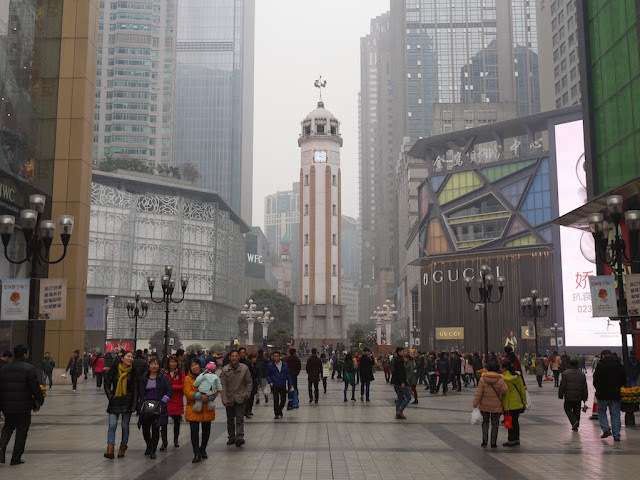 Below are four photos I took of the square on an overcast and smoggy day in January last year. 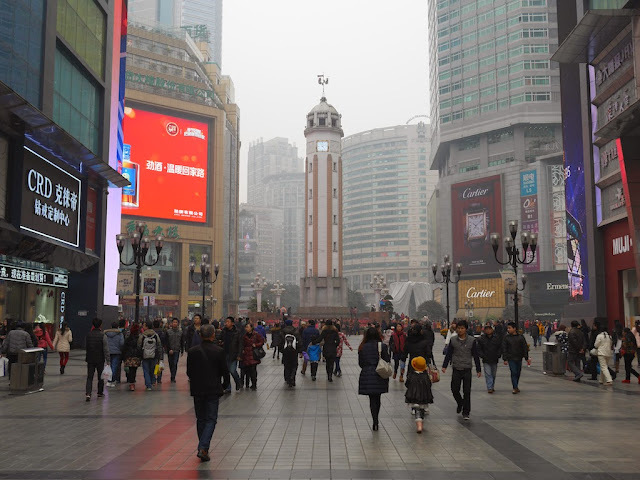 The first photo was taken approximately facing southwest, similar to the Xinhua News photo but farther away from the monument. The following three in order approximately face southeast, northeast, and northwest. 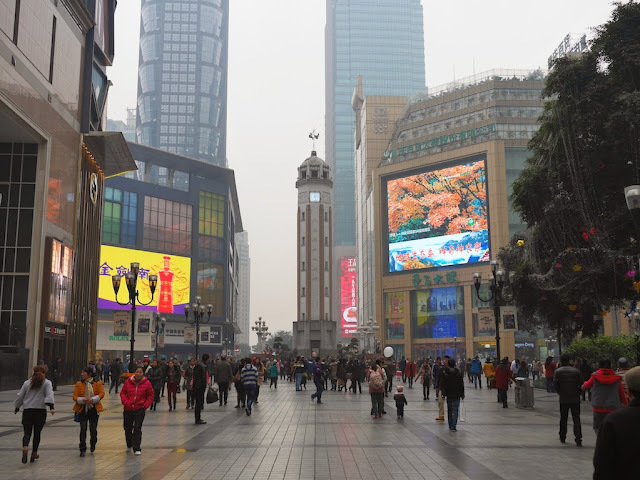 A dense commercial district with a wide range of eating and shopping options, including a number of luxury brands, surrounds the square. 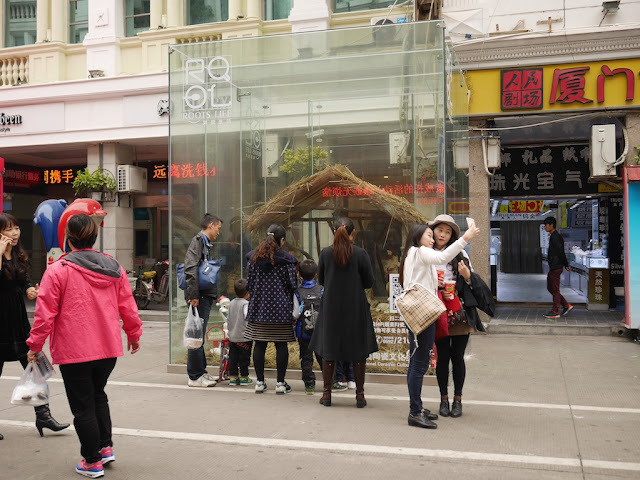 In the background of the last photo, the Apple Store which opened last year can be seen when the entrance was covered with a tarp before some special art was revealed. 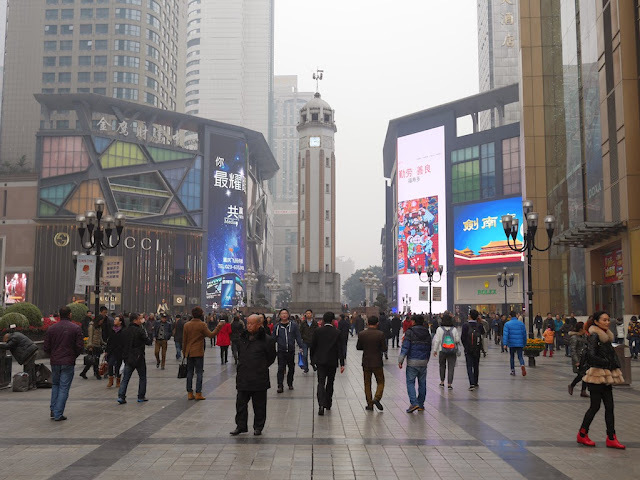 Even if food or shopping isn't on your mind, the area is great for people watching as it is frequented by many locals and Chinese tourists who visit Chongqing.